Biology and Agricultural Biotechnology majors often choose this option, because the courses required by their home departments already satisfy most of the Chemistry department requirements! 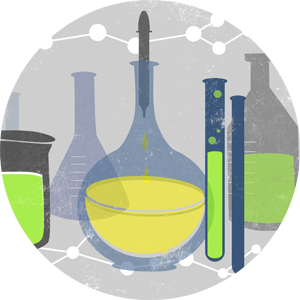 Only the following additional courses are usually required to earn a BA in major Chemistry as a second major. *One additional credit of a communications class is required in the home department. Students in departments other than Biology and Agricultural Biotechnology should consult the Chemistry B.A. requirements to see whether a double major is feasible for them. Students may also choose to earn a BS major as a second major. For this purpose the Chemistry BS – Biochemistry option couples nicely with the A&S Biology major. Note that if your home department is not in the College of Arts & Sciences, you do not need to fulfill the A&S requirements to earn a second major in Chemistry. Premedical students will find that a second Chemistry major immeasurably improves their chances of getting into the medical school of their choice. And if medicine turns out not to be their career of choice, the Chemistry major provides many more options for alternative vocations. The most authoritative information about our Chemistry Undergraduate Programs is available in the Bulletin/Course Catalog issued the year the student started the program.